The WORX GT 2.0 is a powerful string trimmer, a precision edger and even a mini-mower -- all in one lightweight, cordless machine. The 20V WORX GT 2.0 adjusts to you, and to the challenges of your yard, for professional results every time. Includes a 3 Year Warranty & 30 Day Money Back Guarantee. 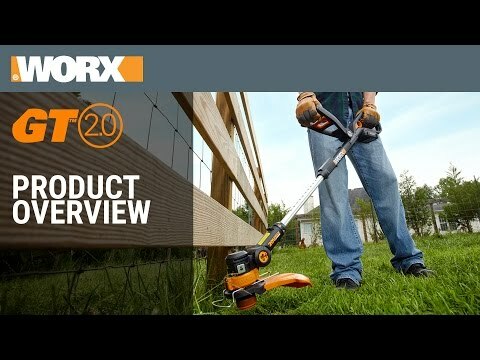 The WORX GT 2.0 string trimmer has taken grass trimming and edging to a whole new level of power and function. With the 20-volts of MaxLithium battery power, the GT 2.0 provides longer run times and more power. The 12-inch cutting diameter means more trimming in less time. Not only will this cordless trimmer convert to an edger in seconds, but it is also a mini mower. It has dual-positioned in-line wheels that make edging a breeze. The wheels can also be used as a "mowing-like" function for detailed trimming around landscape or hard to reach areas. Tool-free adjustments make the WORX GT 2.0 String Trimmer / Edger / Mini-Mower easy to use for anybody. The head tilts a full 90° to let you quickly and easily trim in those hard-to-reach places, while being fully supported by wheels. It is also equipped with 100% single line feed which means no bumping to extend the line. The WORX GT 2.0 String Trimmer features an adjustable spacer guard to protect plants, flowers and garden furniture from damage while trimming - ensuring that you'll never again accidentally cut where you didn't mean to! The trimmer only weighs 5.7 lbs, even with the battery installed. As light as this is, the ergonomic design ensures the weight is evenly distributed between the main and auxiliary handle to make trimming a comfortable, easy-to-manage experience for anyone. I’m really tall/short. Can I adapt the WORX GT 2.0 to my height? Absolutely! 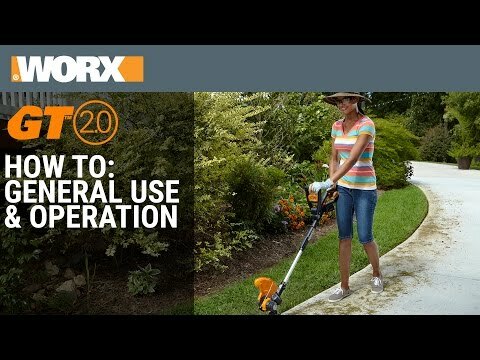 The WORX GT 2.0 is designed to be fully adjustable from the telescoping shaft, multi-position auxiliary handle, and pivoting trimmer head. Don’t contort yourself to fit your trimmer, let your trimmer adapt to fit you. How do I convert from trimming to edging? How do I use the mini-mower feature? Converting from trimming to edging, or to a mini-mower is quick and easy. For your convenience, we’ve included all the steps in a short 2 minute Instruction Video. Battery powered DC motors are not rated for horsepower as output power is only measured with gas or induction AC (corded) motors. WORX lithium powered products were designed with sufficient power to get the job done quickly and easily. What’s the Free Spools for Life offer? How do I get them? Each GT 2.0 includes three (3) pre-loaded spools of cutting line to get you started. Extra spools are free of charge, as long as you own your trimmer - you just cover the cost of shipping and handling any time you need more! Order additional pre-loaded spools now. Are the spools available in stores? Some stores do offer spools for sale in smaller packs, and while these may be the answer if you run out and need them right away, we recommend taking advantage of the Free Spools for Life program benefits included with the purchase of your trimmer. 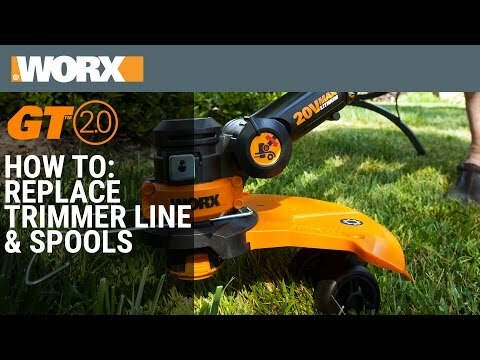 Can other cutting line be used with the WORX GT 2.0? The WORX GT 2.0 can accept any standard 0.065” cutting line found at your local garden or home center, however the automatic feed function isn’t guaranteed to work properly. Our special double helix line is designed to work with the GT 2.0 for a quicker and more efficient cut. This helps you maintain a healthy, professionally groomed lawn. With the purchase of your trimmer, you’re automatically enrolled in our Free Spools for Life program. Can I use the tool without the safety guard? The safety guard is an essential part of the tool. Not only does it keep you safe from any debris from the trimming & edging, it also helps regulate the length of the cutting line. Without the safety guard, your GT 2.0 will not operate properly and you are at risk for injury. If you decide the Worx 20V GT 2.0 isn’t right for you, we offer a 30-day Money Back Guarantee from date of receipt (less shipping and handling). Please call our customer service center at 1-866-354-9679 (WORX) and we’ll be happy to assist. View more information here. Need a spool cap cover? Ready for a higher capacity battery? Many replacement parts are available online under Accessories. "Light, quiet, and emission-free, cordless string trimmers are ideal for quick jobs. This 20-volt unit one-ups all the other electric entrants: A set of wheels lets it roll easily and keeps the string a consistent distance for pin-straight cuts. Edger-to-trimmer transitions are seamless, too. " 20V Power Share GT 2.0 12" String Trimmer - Tool Only (Discontinued) is rated 4.7 out of 5 by 180. Rated 5 out of 5 by Farmer Joseph from Made me a believer My wife purchased the string trimer a few years ago because she does all the weed whacking on our farm and I told her that it was a wast of money But after watching her using it summer after summer showing it no mercy, she has two battery's to extend her trim time. When I needed a small battery powered chain saw I purchased a WORX to carry on my 4 wheeler when I do fencing it also is one work horse of a tool. I am how a firm believer in WORX battery power tools. Rated 5 out of 5 by Captivated from Outstanding! I have purchased Worx products since 2013. Recently, my trimmer/edger was broken. Although my warranty expired the customer service person allowed me to take photos of my damages and I was sent another up to date edger/trimmer. My neighbor often give me complements on my lawn. but now that I have the new edger/trimmer my lawn is captivating. Thank you Worx. Thank you customer service personnel. Rated 5 out of 5 by Kinch from Very Useful Trimmer I got this trimmer last fall. I use it to trim the lawn after mowing is done as well as edging our walks and driveway. Besides taking care of my yard, I also to the trimming/edging at my daughter's home. The design that allows the head to be rotated and the little wheels make edging super easy and consistent. Being that I use it at two different places, I really appreciate the ease of adjusting it's length. It works great for any height and also fits in a small trunk. Replacing the spool of string only takes 2 minutes and the battery life in unbelievable. Totally satisfied.